Guest Host Chef Steve Samson (co-executive chef & co-owner) of Sotto in Los Angeles and Producer Andy Harris preview the show. Danielle Chang the founder of the series of LUCKYRICE Night Markets staged across the country is back with us to preview the upcoming Las Vegas evening at The Cosmopolitan Las Vegas. “Salt & Straw, Portland’s iconic artisan ice cream brand known for its innovative, small batch and handmade flavors, opened the doors to its first Los Angeles scoop shop on Saturday, September 13th in Larchmont Village.” Founder Kim Malek is with us with the scoop. The incomparable Sherry Yard is a two-time James Beard Award-winner. 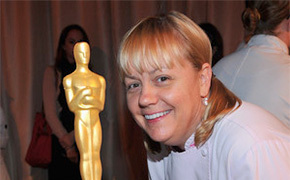 Her Beard Foundation honors are for both her acclaimed dessert and pastry book as well as for Outstanding Pastry Chef. The Princess of Pastry joins us to chat about the upcoming C-CAP’s Sweet & Savory Spectacular benefit, iPic Theaters, and the soon-to-be Helms Bakery in Los Angeles. Hidden, in plain sight, just South of Angel Stadium at the corner of State College and West Chapman Ave. in Orange is Chef Daniel Godinez’s Anepalco. Anepalco is a modern Mexican-French restaurant with a refreshing cocktail program. Kristofor “Kip” Barnes, the author of Beer Lover’s Southern California – Best Breweries, Brewpubs & Beer Bars, is an accomplished gold-medal-winning home brewer and the founder of the brew blog Bierkast.com. He also is the co-founder of Los Angeles Ale Works and is a founding member of the L.A. Beer Bloggers. Today’s guest host is Executive Chef Steve Samson of Sotto in Los Angeles located just East of Century City. He was previously the high profile executive chef at Piero Selvaggio’s Valentino in Santa Monica. Orange County diners remember him as the opening executive chef at Pizzeria Ortica in Costa Mesa. Salt & Straw partners with local artisans, producers and farmers to create one-of-a-kind, gourmet flavors. Their ice cream is handmade using only all natural and local cream. The company, which began in 2011, has three scoop shops in Portland and now one in Los Angeles. Each shop serves scoops, sundaes, milkshakes and floats as well as pints to go. The “Early Autumn Harvest Series,” available now through October, is a cheat sheet for Southern California’s best seasonal ingredients. Highlights include sweet almonds from Kern County, last of the season peaches from Burkart Organic Farms in Dinuba, CA, Butter & Salt doughnuts from Sidecar Doughnuts and Grand Poppy liqueur from Greenbar Distillery in Downtown L.A.
Sherry is the honorary co-chair (with Suzanne Goin of Lucques, A.O.C. and Tavern) of C-CAP’s Sweet & Savory Spectacular Benefit set for Sunday Afternoon, Oct.,19th at The Art Institute’s campus in Santa Monica just above the airport. Both of Sherry’s current projects, iPic Theaters and Helms Bakery, will be serving distinctive tastes from their menus. Sherry serves on the Los Angeles Advisory Board of the Careers through Culinary Arts Program as well as on the National Board. Sherry will talk about how she is changing movie theater food for the better in her special culinary role at iPic Theaters. In Southern California iPic has luxury theater complexes in Old Pasadena and Westwood Village. Sherry will also have an update on the ambitious Helms Bakery project. Hidden, in plain sight, just South of Angel Stadium at the corner of State College and West Chapman Ave. in Orange is Chef Daniel Godinez’s Anepalco. Anepalco is best characterized as a modern Mexican-French restaurant with a refreshing cocktail program. It also has a shaded patio. Anepalco takes authentic Mexican ingredients with their bold flavors and infuses them creatively with traditional French techniques. The result is a fusion of creams and chiles with the cuisine served in a gourmet manner. Chef Godinez’s kitchen only uses the freshest of ingredients. In addition to the lunch menu available daily, Anepalco serves brunch seven days from 11:00 a.m. to 3:00 p.m. Chef Steve was just in Italy for a Family occasion.